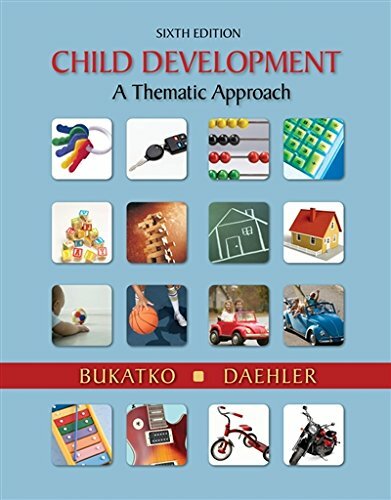 618608656 -Bukatko/Daehler’s CHILD DEVELOPMENT: A THEMATIC APPROACH provides a comprehensive, topically organized, up-to-date picture of development from conception to adolescence. Most important, it draws students’ attention to the themes that replay themselves throughout the course of development, fundamental issues that resurface continually and that provide coherence to sometimes seemingly disparate research. The themes can serve as frameworks to help students further understand and remember the multitude of facts about child development. Bukatko/Daehler’s sixth edition text draws on five themes, Nature and Nurture, Sociocultural Influence, Continuity/Discontinuity, Interaction among Domains, and Risk/Resilience. By drawing on these themes, the authors hope to stimulate readers to think about the process of development, or why it proceeds as it does. Through new For Your Review and Reflection sections, the authors also hope students will engage with the text and become more adept critical thinkers, who are more likely to appreciate the ramifications of theory and research for applied issues such as parenting practices, education, and social policy for children, which are ultimately concerns for us all.